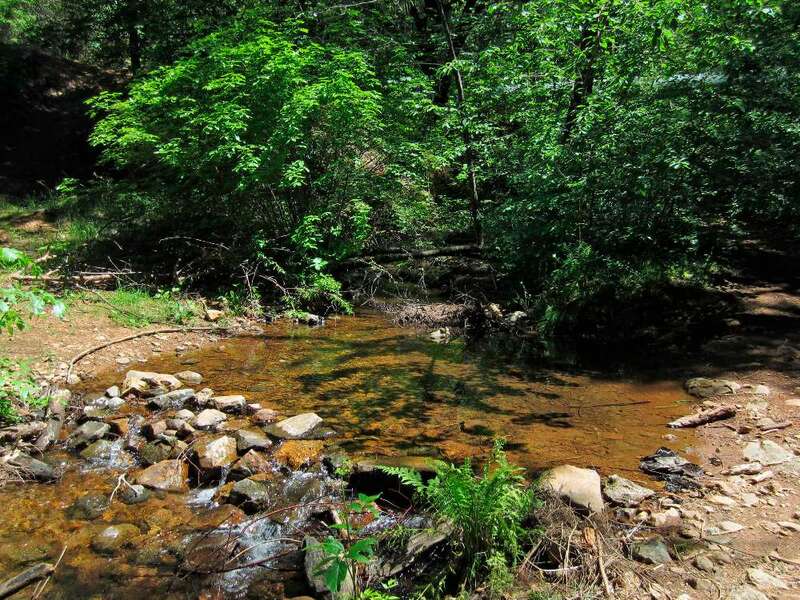 This popular trail offers an almost level walk along a peaceful canal through a forest with many Douglas firs and dogwoods. At 3200′ elevation, it is a bit higher and cooler than many local trails. There are several places along the route where views open up briefly to more distant scenery. 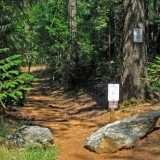 Trail signs: Some trailheads have signs (see below). Mileage indicators every 0.5 mile. Rules: Foot and bike only. No motorized vehicles. Dogs on leash. 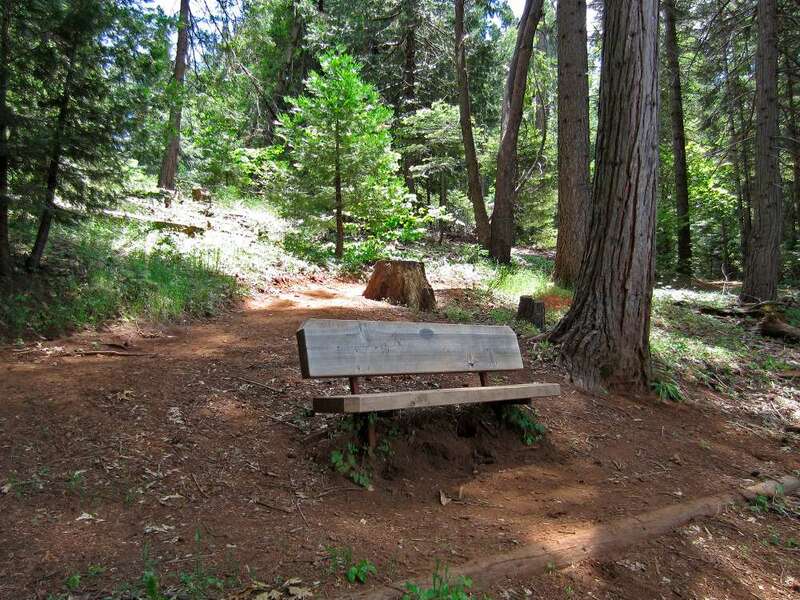 Stay on the trail; respect private property – talk quietly, pick up after yourself. Hikers and cyclists watch for each other and pass safely. 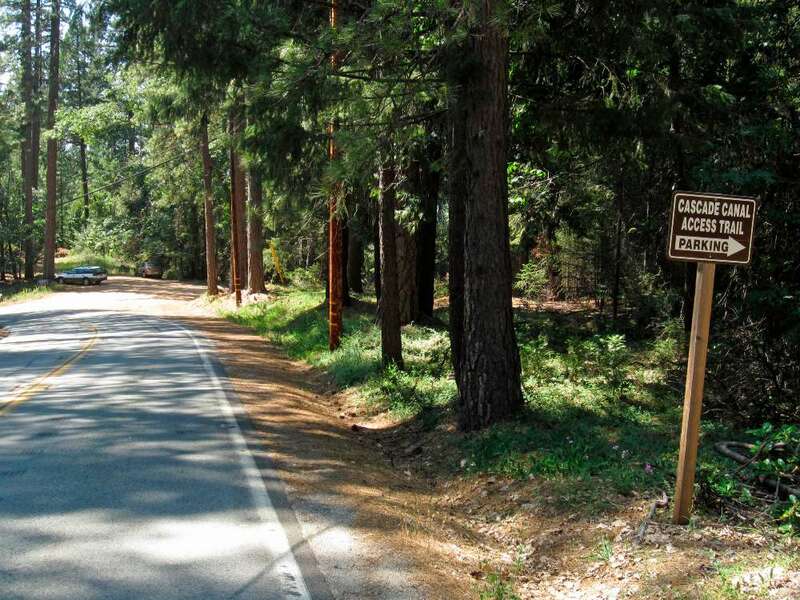 Gracie Road Trailhead: Take either Gracie Road or Banner Lava Cap Road easterly from Nevada City. 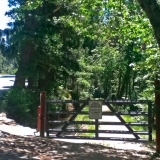 The parking area is on Gracie Road about 700 feet northwest (downhill) from the intersection with Banner-Lava Cap Road. 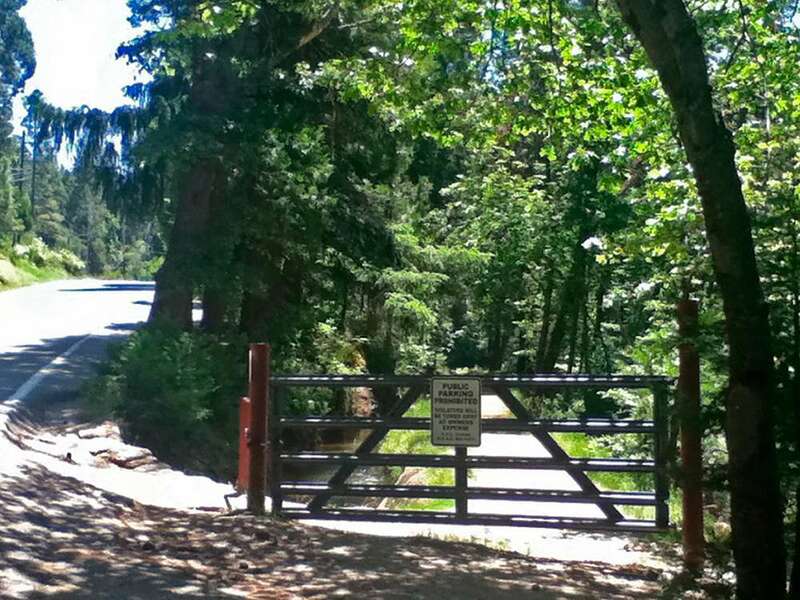 Look for a “Cascade Canal Access Trail” sign on the east side of this parking area (N39.24106 W120.99855). 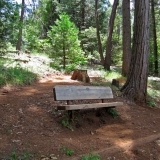 A pleasant trail leads into the forest from this trailhead and connects with the main trail in 0.3 miles. Go left at the main trail. 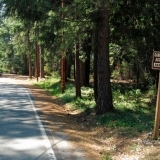 Red Dog Road Trailhead: From downtown Nevada City take Boulder Street east (becomes Red Dog Road) for about 2 miles and find Pasquale Road on your left. Note your mileage there and go 0.3 mile farther on Red Dog Road where you will see the canal and a gate on your right with a “Public Parking Prohibited” sign. There is parking on the right shoulder immediately uphill from the gate. 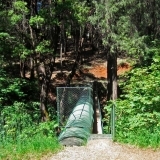 The trailhead is at the gate (N 39.25919 W120.97511). 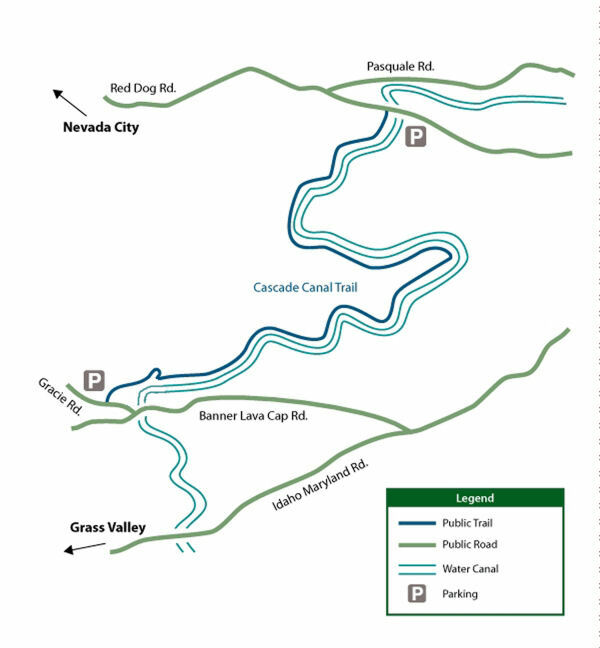 Trail tips: This is an easy trail to follow since it runs along the open water of the Cascade Canal for most of its 4.5 mile length. 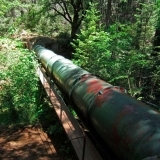 In a few places the canal disappears into piped sections and in one place, at about 1.6 miles east of the Gracie trailheads, the canal disappears into a pipe across a ravine and the trail is simply a dirt road for a short while. The western half of the canal trail going east from Gracie Road is the most heavily used. It runs along the edge of a residential area where you will see houses across the canal, some unique private “drawbridges” that homeowners use to get on the canal path, and even a gazebo. 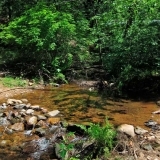 Orene Wetherall side trip: At about 0.75 mile east from the Gracie Road trailhead, you will find the clearly marked Orene Wetherall trail branching down to your left (N39.24369 W120.98742). 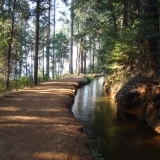 This is a nice 1.2 mile round trip “out and back” trail that switchbacks down (280′ elevation drop) through lovely forest to its end point, then you climb back up to the main canal trail. 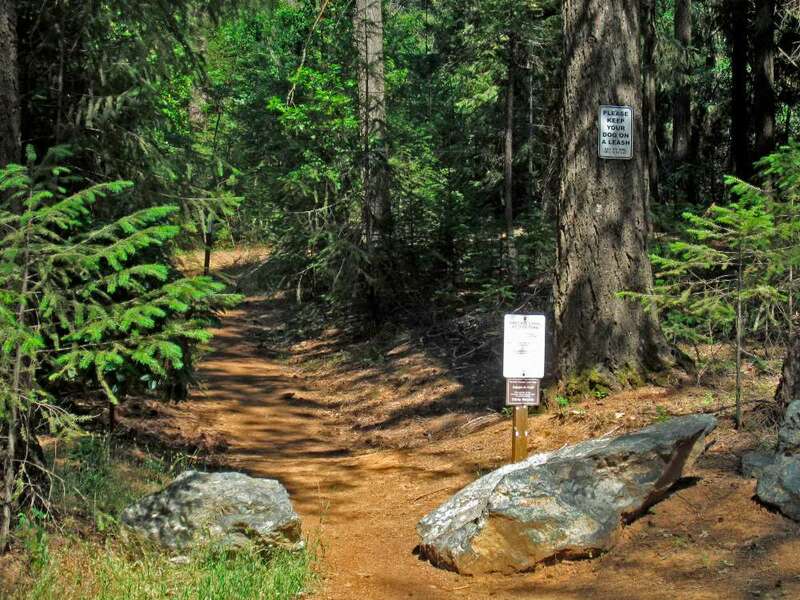 If you hanker for some elevation change instead of a flat trail, try going from the Woodpecker Way trailhead down to the Cascade Canal trail, turn left and go about 0.2 mile, turn right at the Orene Wetherall trail, follow it down to its end, then return uphill to the beginning on Woodpecker Way. This route gives you an elevation change of about 350′ down and 350′ back up. There is a guide to the Orene Wetherall Trail in the right column of this web page. 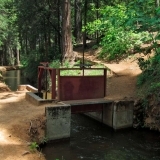 One of the best viewpoints along the entire canal trail is about 0.2 mile east of the Orene Wetherall trailhead, where there is a red sluice gate across the canal (this is also where the Woodpecker Way access trail meets the canal trail.) Here you can look out through thinned forest and see downtown Nevada City and distant ridges beyond. The white spire of St. Canice church and the bulk of the Nevada County courthouse are the most obvious landmarks visible in the town. If you go a short way up the Woodpecker Way access trail you will find a great bench where you can enjoy this view to your heart’s content. 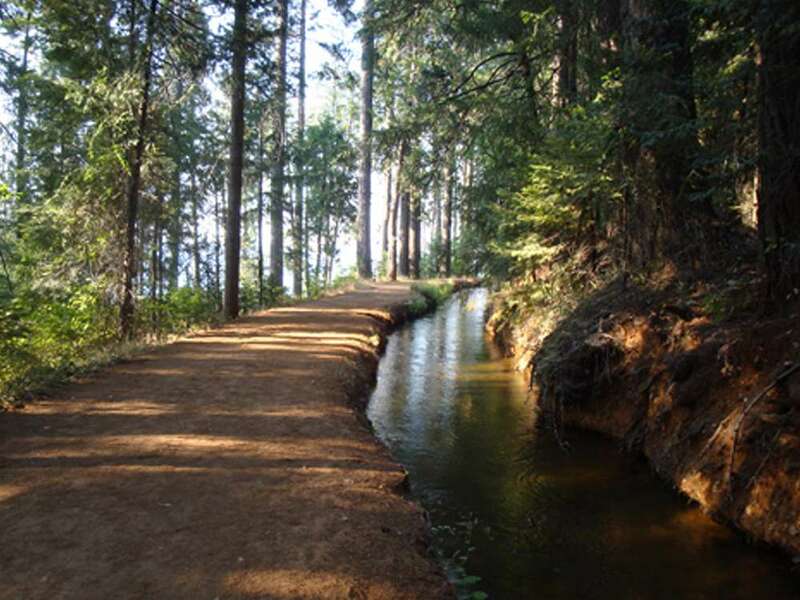 The eastern half of the canal trail — from Banner Mountain Trail to Red Dog Road — gets the lightest use and feels more remote. 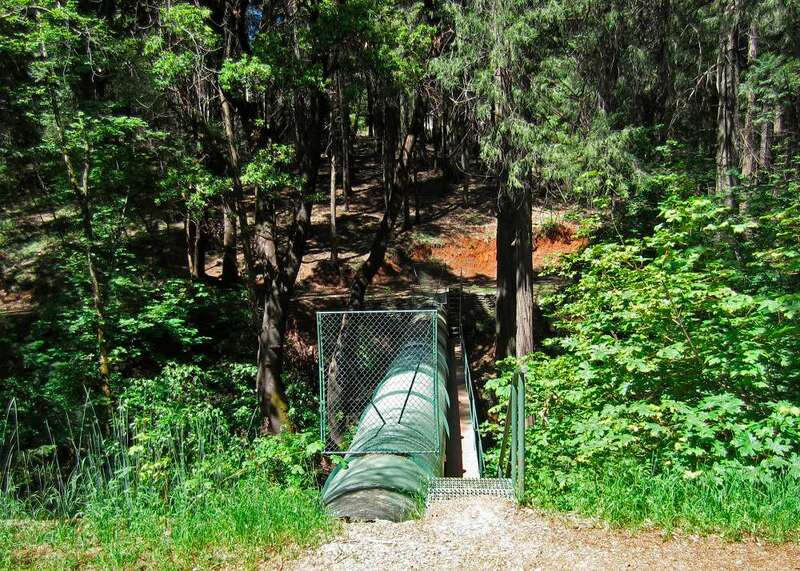 A landmark along this section is the crossing of Little Deer Creek where another metal pipe with catwalk bridges the ravine over this pleasant creek which is usually flowing. 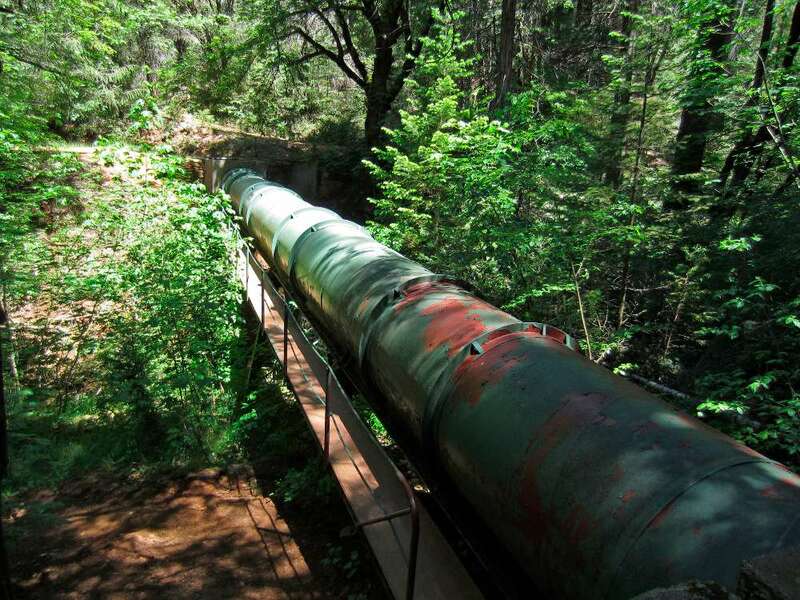 A dirt bypass trail drops down from each end of the pipe and fords the creek. 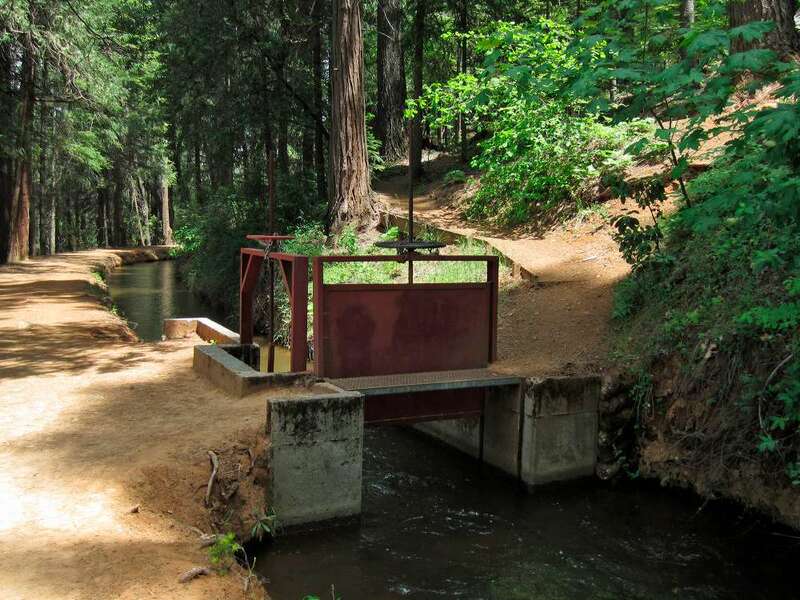 Mountain bike riders use this bypass to avoid the catwalk. It is steep and may be slippery, so take care if you use it.